NORIS-IB GmbH was founded as an independent IT-consulting and software company in 1991. Our core capabilities are the design and development of customized application programs as a result of the IT-based process optimization (Vision Industry 4.0). over 30,000 users at Siemens AG Healthcare are currently working with i|NORIS® applications worldwide. The idea of developing a compilation of programs with the working title "Golf Information System: [GI18]" began in 2003 with the hosting and organizing of our own "NORIS-IB® CHARITY GOLF CUP" tournament. 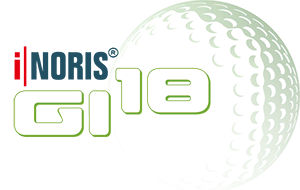 Since then, experts have booked GI18 for their golf events and provided feedback on how to enhance and improve the software. Over the years, experience and practice in the field led us to develop a program suite known today as the application "i|NORIS®-GI18", which has been placed on the market as an independent product since 2012.